Hauling Secrets » Blog Archive » hauling Nazi secrets? So me and Legendary Bobby Gene knock on the front door of this house – no answer. We hear noises, so we follow the driveway around to the back, where an old woman and two middle-aged women have the contents of an extra-deep two-car garage – almost a barn, really – spilling out into the backyard. One of the ladies explains to me and LBG that their father passed away and they plan to sell the house. Only first they have to empty “Dad’s Garage”. “Dad’s Garage”, it turns out, was a place where only Dad could go. It was off limits even to his wife, who during the job was working in a manic way beside us, expressing an oddly hesitant surprise at each new thing she brought out into the light. But it’s normal for family of the deceased not to want to deal with – or even to know – what their loved one left behind. That’s what haulers are for. Hundreds of hot rod car magazines. A few boxes of books from the Loompanics catalogue – and others – dealing with how to make explosives from household chemicals, how to blow up bridges and other structures, and how to completely change your identity. Membership material and other correspondences from little-known Southern-based militia groups. Roughly one thousand VHS tapes, each with three or four movies on it. That adds up an entire video store worth of movies. Nothing obscure or exotic, no preponderance of any particular genre or era, just a seemingly random – though totally exhaustive – rundown of the movies shelved at any old corporate rental house. A complete set. As if every single movie the guy ever watched – he recorded. Adding in your mind this collectable Nazi propaganda book with some of the other things from the off-limits-to-everyone garage – books on how to change your identity, links to racist militias – you start to imagine things. Every now and then a story comes on the evenings news about another Nazi war criminal found hiding in your average American suburb. Who knows how many others have died and taken their secrets to the grave. And how many haulers have hauled their secrets to the landfill…? whoa smidge. goldmine of oddness. Because now these item’s are probably being stored in your family’s house, and some day, your old lady wife (poor, innocent bystander) is going to get pretty odd looks when they haul out a lotta boxes of pornface, nazi propaganda, creepy clown paraphernalia, dental castings, 3,000 folding chairs, or whatever else you have in there. 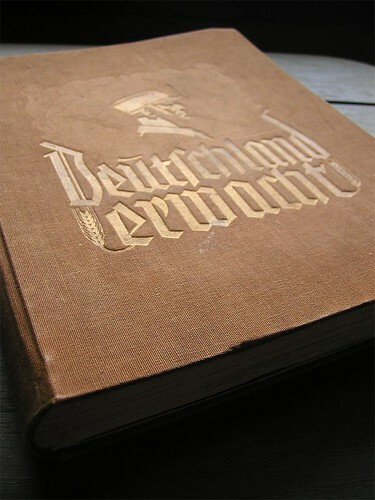 My name is Bryan… I recently visited my father and he showed me some historical books from the roots of my German family… He handed down several pieces of Nazi history that my family had collected through the years of the war… I have been researching some of the medals and such, but the one thing thats really caught my eye was this book you’ve written about… “Germany Awakes” It has got me wondering the history and what its all about… If you could please get back to me and give me any information you might have on it, I would be greatly appreciative… Thanks again for your time. Bryan, I don’t know much more about this book than what I’ve written here, which I learned just from Googling around.